It’s time for our favorite 60 surfers to hang 10 again at Carlsbad’s South Ponto State Beach. It’s softball for guys with soft hearts. Umpire Chris Rutz of Oceanside will work the Little League World Series this month in Williamsport, Pennsylvania. The ELL Juniors, ages 13-14, are off to the Juniors World Series in Taylor, Michigan. Welcome to town, Josh Lewin. Jim Ault, the San Diego Aviators general manager, has no problem showing off the fruits of victory. 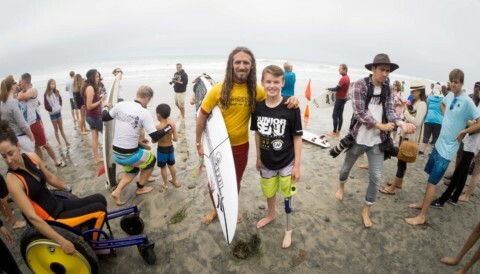 Adaptive surfing was part of the Bro-Am for the first time and you bet it was a big deal.